Professor Nicholas Proksch’s office is underneath the Chapel. He teaches Religion courses at Bethany Lutheran College and often walks to get to campus to get work done, even on Sunday afternoons, and preaches for Chapel. On a Wednesday afternoon in March, he sits in his office, the door open, busy preparing for classes and waiting to meet with a student. Below are excerpts from their conversation about his experiences as a Pastor. I was at a small church and wanted it to have an evangelism focus, but you don’t just have a rolodex of ‘here are good ideas for evangelism’, you have to think things through. One thing I thought of was ‘Well, there’s a farmer’s market, and it sure would be nice to be involved with that, but I just don’t want to just have a table where I harass people from it saying, “Come to my church!”’ so I got to kind of think of a thing to do. I thought, ‘I should do something at the farmer’s market,’ so I started selling pretzels. Ok, so the pretzel. It has, you know, Christian symbolism and message behind it, so it’s kind of a little ‘sneak in some evangelism’ stuff, and I could put the story of the pretzel on the packaging or bags. And then, I didn’t want to be like “Oh, we’re a greedy church asking for your money”, so then I made it so that when we sold any pretzels, we gave all the money to a charity sort of thing- the synod’s program in India, is what we did. The pretzel, it turned out, was totally a process. The pretzels at the mall aren’t the pretzels you get in Germany, so when I travelled abroad, I just went ‘wow, these pretzels are really awesome’. The secret is lye. You dip it in lye, and that’s what gives it the brown and pretzel-y flavor. Anyways, I was able to not only try to come up with this evangelism idea that’s somewhat coherent, but also figure out how to bake a pretzel in a professional way because, as it turns out, baking isn’t quite, you know (laughs), it’s not like making a thing of noodles where you pour it in some boiled water. It’s actually a mess of things you have to do to get it just right, so it was totally outside of my expertise. I love mall pretzels too, in their own right, [but] they’re really not too pretzel-y, because they don’t use lye. They’re just kind of buttery and salty, which is why they’re still yummy but not as pretzel-y because they don’t use lye. That’s something that, if you misuse it, can burn on you. It’s a pretty caustic chemical. Some people think you use baking soda, because it’s also somewhat caustic, but the pH scale is also logarithmic, in how caustic or acidic something is, so it’s actually a huge deal if you’re going to use baking soda versus lye, which is extremely caustic. And it seems weird to use it for baking ‘cause you can also make soap with it. But it’s a fun little thing. Actually, I’m doing it for Mt. Olive- I’m going to try to bake them for church this Sunday, which is probably why it’s on my mind. 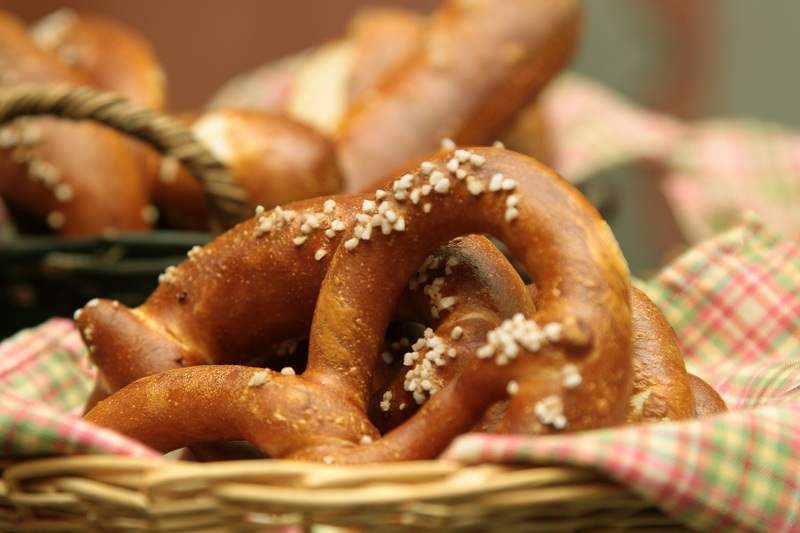 Pastor Ulrich wanted to do it for Easter for kids because of the pretzel story, and he knew I had this pretzel thing, so he asked “Why don’t you make pretzels?”, and I thought “Ok…”, cause I’m really busy, but the pretzel business keeps bringing me back in. I thought, ‘Well, now I have to practice the Sunday before because I’m using different ovens’. It’s really critical to have your oven dialed in just right for baking and they have a convection one, so then I really got to be like making sure I don’t- because those convection ones, you have to be careful of the air flow. I’m sorry, I’m really rambling… I’m ruining everything (laughs). But if you’re at Mt. Olive on Sunday, you should grab a bunch of pretzels, if they turn out ok. We’ll see. I also do bagels, because after the pretzels, I got into baking, and then I thought it would just be a fun church thing to have bagels in church. My first church was really small, and I was going through a rough patch – Pastors have struggles too, you know. As a Pastor, you have a lot of behind-the-scenes stuff that can be really stressful. And it isn’t bad, it can be rewarding, but sometimes working through those behind the scene challenges, like when you have a couple in marriage counseling, or something- It’s hard to be doing that and not have it take some kind of toll on you too. Or, if there’s a conflict between a couple of people at church, you have to try to mediate that, and that’s always in the back of your mind, like ‘Oh, I just hope everyone chills out’. You kind of carry that stuff on your back as a Pastor, week to week sometimes. I thought, ‘You know, at least this baking thing, everyone gets on board with it, it’s a fun thing in the morning, and If we have visitors we can have bagels and talk.’ And that was actually a good idea, because I’d say “Oh, try these bagels,” and then they’d try the bagels, and everyone would all talk and be happy. So, I just started baking bagels every Sunday, which was a lot more doable when I was at my first church in Michigan. When I was in Northern Minnesota, which was a larger congregation, I only did that every now and then, but it was still well received. So, that was my foray into baking. The following Sunday, Prof Proksch can be seen in the kitchen of his church, wearing a chef hat and blue polo as he quickly transfers pretzels from the hot oven out onto sheets, which are brought to the counter where people can get at them. They are indeed delicious, and not like mall pretzels. They are authentic, made with lye and real salt. Hannah Bockoven is a Bethany alumn who majored in English and minored in Sociology. She currently resides in Mankato and enjoys babysitting, books, and good conversation. She plans to pursue an MFA in Creative Writing.